Continuing on a round of films featuring Johnny Depp, I have a light-hearted drama that connects you to your childhood. Do you remember watching Peter Pan as a kid? It was one of my favorite movies. I still love Tinkerbell. Well, for the rosé round I decided to pair up Finding Neverland. I've never seen this movie but always wanted to and it felt like the perfect time. I just wasn't prepared for the tearjerker ending. I've been really bad at picking movies that start the waterworks lately. The next one will make me laugh...or scream. We'll see. I haven't quite decided yet. The rosé of choice came from my most recent ClubW delivery. I was expecting something fresh and light, perfect for summer. That's what I got! 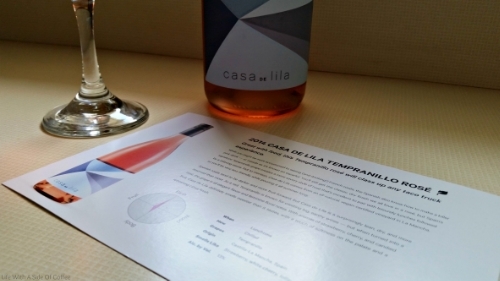 The 2014 Case de Lila Rosé comes from Castilla-La Mancha, Spain and has a signature scent that consists of strawberry, white cherry and lollipops. ClubW says, "While you might be more accustomed to seeing (and drinking!) French rosés, the Spanish also know how to make a killer pink drink - or rosado as it's known en español. You'll still get the classic, dry finish we all love in a rosé, but Spain's signature Tempranillo grape creates a more savory style of rosé that's excellent to pair with leisurely lunches followed by a relaxing siesta. Not to mention. Casa de Lila comes from an all-natural, vegan-certified vineyard in La Mancha, so you'll be very eco-friendly while pouring it all summer long. Spanish rosés tend to be darker and more fruit-forward, but Casa de Lila is a surprisingly lean, dry, and more reserved than most. As a red, Tempranillo is known for creating big, earthy wines - but when turned into a rosé, the grape is all elegant flavor and feminine floral notes. With aromas of strawberry, cherry, and candied fruit, Casa de Lila definitely smells sweeter than it tastes, with a touch of saltiness on the palate and a refreshing citrus finish." Finding Neverland is about a playwright who befriends a family that consists of a mother and her four boys. Their father died years before of cancer and it's obvious they need to feel like children but also have a positive male figure in their lives. James Barrie is running out of creativity and fast. After meeting these boys and spending time with them each day, he starts to write a story inspired by them. It's unlike anything he's ever written before and according to several people, his best work yet. That story is what the rest of us know as Peter Pan. We follow their adventures through the imagination and connect with the characters one by one, especially Sylvia, Peter and James. 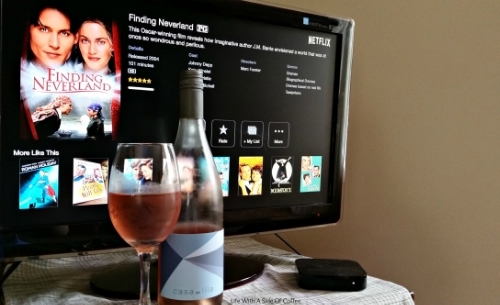 I paired Finding Neverland with a rosé because it felt like a perfect fit. I didn't know much about the movie but I new that most of it would be light-hearted. You can't get too serious when you're dressing up in costumes playing make believe. But it does get serious in-between games otherwise this would have been a good movie for the white wine. This rosé was pretty good. I got notes of strawberry and apple on the nose but the flavor was much more understated. I still got the strawberry but there was a bit of pear. The acidity was fair. There was an aftertaste that seemed floral to me with a touch of grape. It was dry but not too much so to turn me off to it. I was really refreshing, welcome on warm summer nights. So what do you think? Have you seen Finding Neverland or tasted this wine before? Do you agree or disagree with the pairing?